8%, damage, not observed by enemy, workshop Germersheim. 8% damage, not observed by enemy, workshop Rhein/Main. 12% damage, not observed by enemy, workshop Limburg. 10% damage, not observed by enemy, workshop Münster. 5% damage, not observed by enemy, Twente-Holland. 99% damage, observed by enemy. NOTE: W.Nr. 160613 was the aircraft of Ofhr. Janz, who was lost on 1 February (see below and here). Uffz. Kurt Langfort, 1. Staffel, fatal crash during ferry flight, 1 January. Fhr. Joachim Wehner, 3. Staffel, missing, 1 January. Ofhr. Egon Badakky, 3. Staffel, hurt when making parachute descent, 10 January. Ofhr. Erwin Janz, 1. Staffel, killed on 1 February. Ofhr. Anton Münzer, 1. Staffel killed on 9 February. 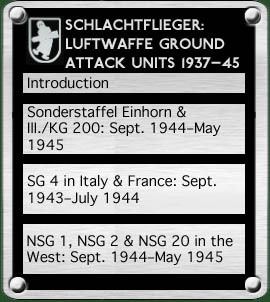 NOTE: Langfort is buried at in the war cemetery at Bonn-Beuel; Wehner and Münzee at Ysselsteyn; Janz at Steinfurt-Borghorst-Haselstiege. both with 35% technical damage. NOTE: Although listed as an F-8, 173909 was an A-8 Werk Nummer. 440535, 440546, 580018, 580596, 583906, 586148, 587803, 931872. NOTE: Although listed as F-8s, the first two were F-9 Werk Nummern. 70% damaged at Airfield 1667, W/T failure. 5% damaged at 1667, undercarriage jammed. 70% damaged at 1667, crashed on starting. 85% damaged at 1667, landing wheel lost on landing. NOTE: Allied Intelligence considered Airfield 1667 to be an error for 1666, Hagenow. NOTE: In both the above returns the Gruppe reported 25 pilots non-operational. This unusually high number may include the men of the fighter training unit which NSG 20 had recently absorbed. Bottom photograph: an extensive article on how the Ju 87 in this picture came to end up where it was.